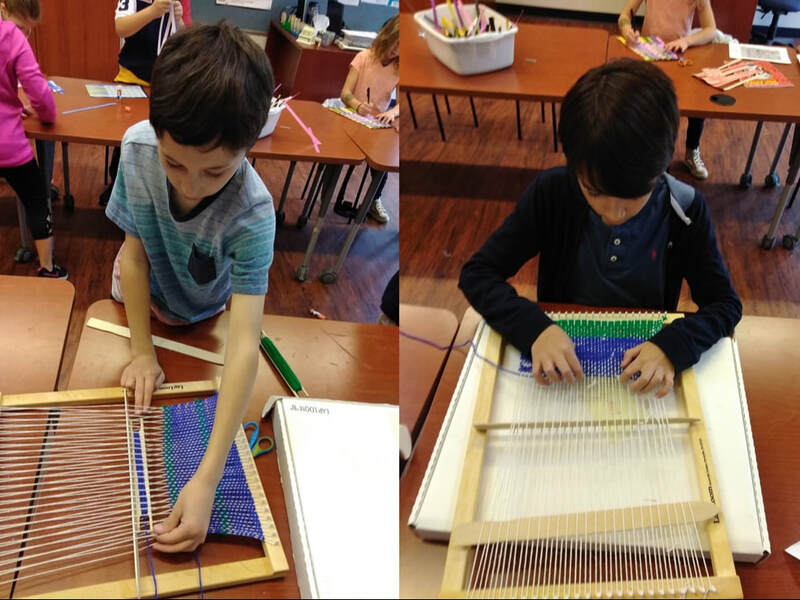 ​Our fourth grade students have been busy studying the art of weaving on a lap loom! We are learning about the history of weaving and textiles as well as colors, patterns, and symbolism and what they mean to different cultures around the world. While all grade levels will be weaving this year, this is the first year 4th grade will be working on the lap looms as it is one of their “Rights of Passage”! 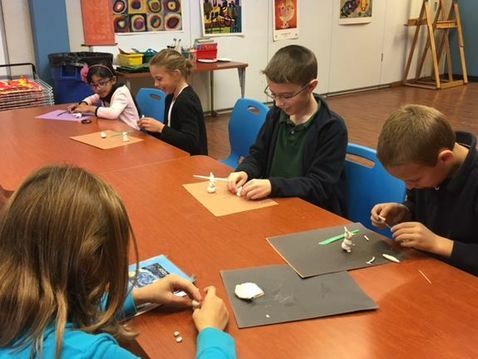 In Art, Fourth and Fifth Grade students created Durama dolls inspired by the traditional Japanese art form. Students studied the art and culture behind the doll and set personal goals to coincide with their finished creations. Students have been learning new ways to paint. 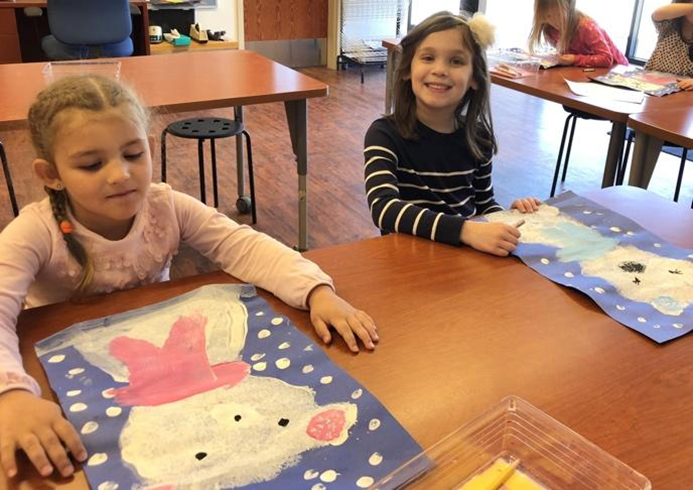 Since the children were inspired by the book The Polar Bear and the Snow Cloud, they created sponge-painted polar bears. During the process, they learned how the stamping method creates texture such as fur. They also explored color-mixing to create tints for the scarves and ears. After the paint dried, the children gave their bears personality by adding details to the face and scarf using oil pastels. Students learned the history and culture behind the Mexican celebration Dia De Los Muertos (Day of the Dead). Then, they created sugar skull masterpieces using paint and crayons. First grade students have been studying line as one of the elements of good art. 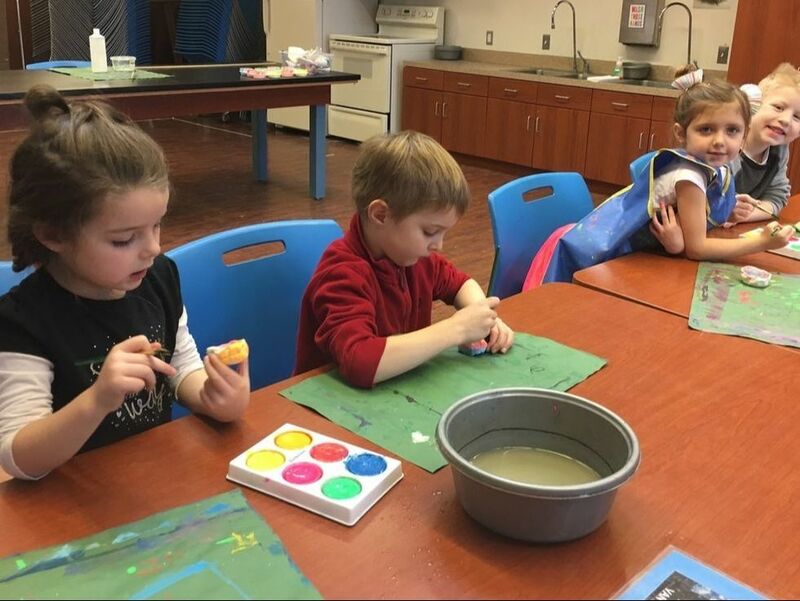 After drawing different kinds of lines, the students used bright watercolors to paint their drawings. 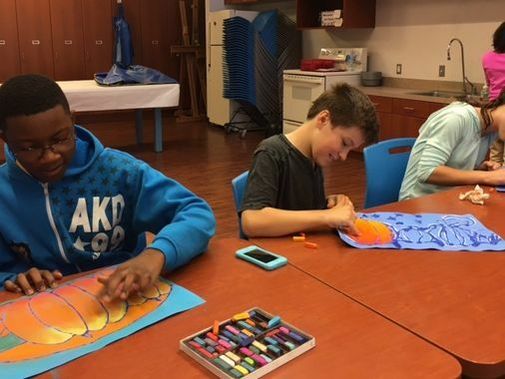 Students in art class have been working together on a collaborative stepping stones project. The project, which is exclusive to Middle School, will become part of an outdoor installation on the grounds of Eagle Creek when completed. 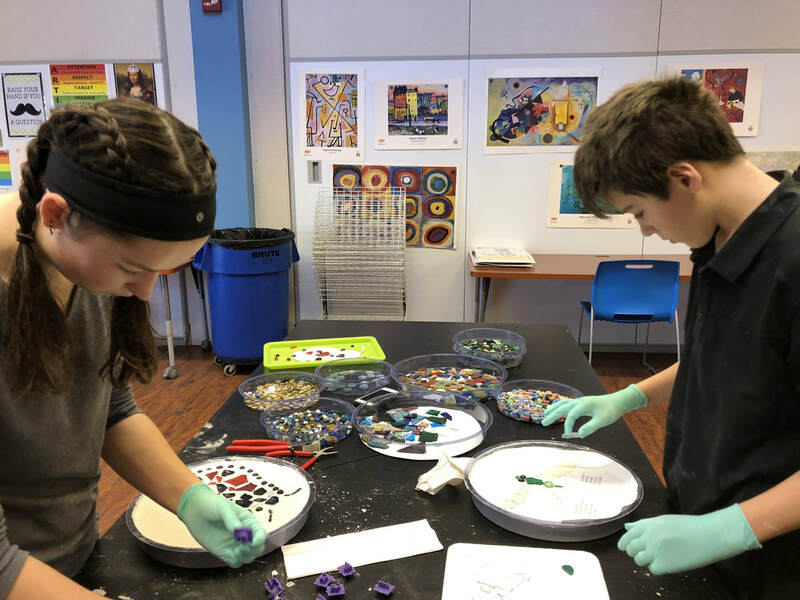 Students were excited to be part of a special project, and they planned and designed their own mosaic art with glass stones and pieces. After designs were planned and completed, students worked in teams to thoroughly mix the cement and pour into the molds. This step was very messy but also tactile, relaxing fun for the students. 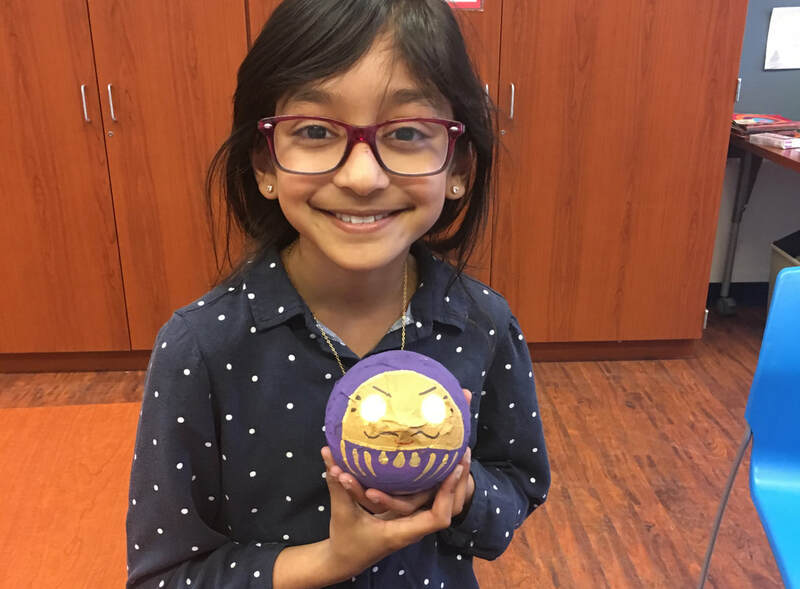 ​Kindergarten students learned how to create clay pinch pots. These students are adding the finishing touches to their pots with bright watercolor paints. 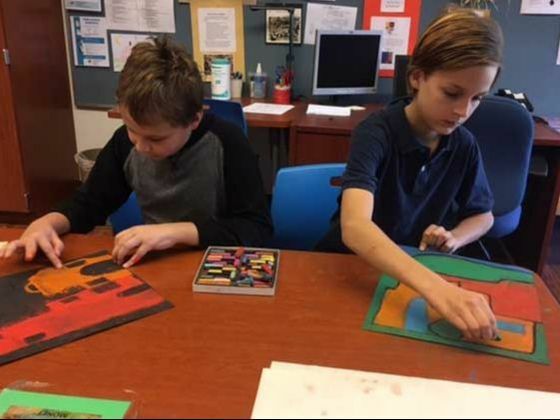 After studying abstract art and practicing color-blending techniques, the students used organic lines to create designs. Later, they added values of light and dark in their work. 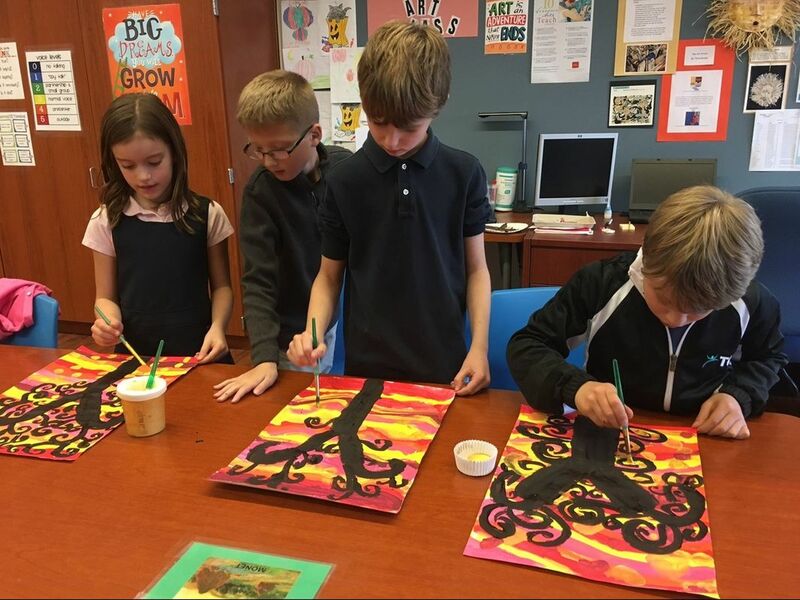 Students learned about the artist Gustav Klimt and studied his famous painting The Tree of Life then used their skills and talent to create their own versions. Students worked on a three-dimensional project using polymer clay. They concentrated on sculpting their snowmen ornaments with careful craftsmanship and skill. 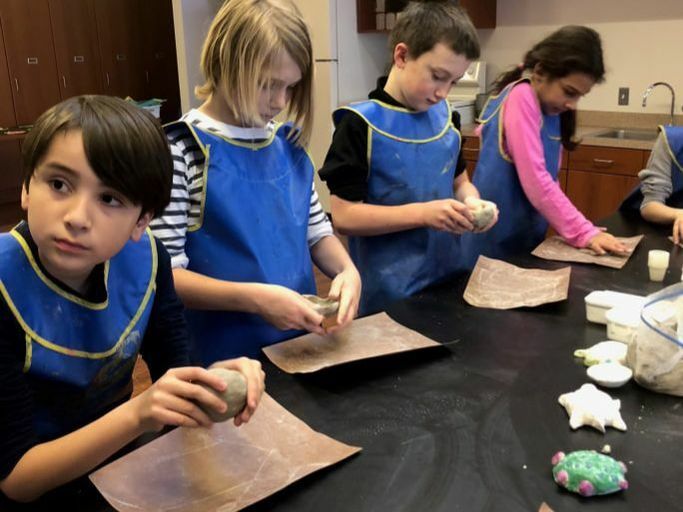 Students in third grade created three-dimensional turtle sculptures from earthenware clay. They began by refreshing their clay hand-building techniques. After some practice, they used their hands to form a pinch pot for the shell and attached smaller pieces to create the rest of the body. After all the pieces were in place, final details were added to give each turtle personality. Using their knowledge of shape, form and space, the students drew realistic pumpkins. Then, they used chalk pastels to produce color renderings with values. To celebrate Earth Day, the fourth grade students learned basic hand-building techniques. 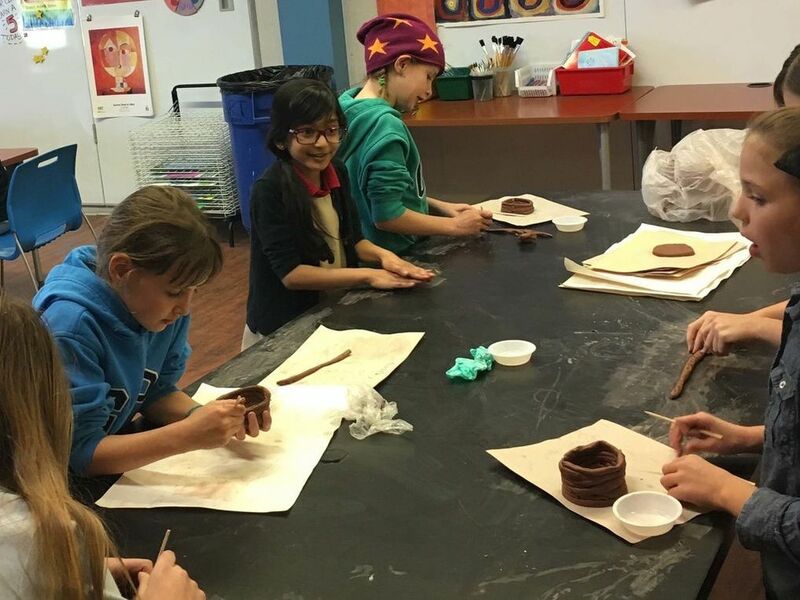 Then, they worked in small groups to create coil pots from clay. Students learned about the architecture of Mexican adobe houses and used chalk pastels to create their own masterpieces. 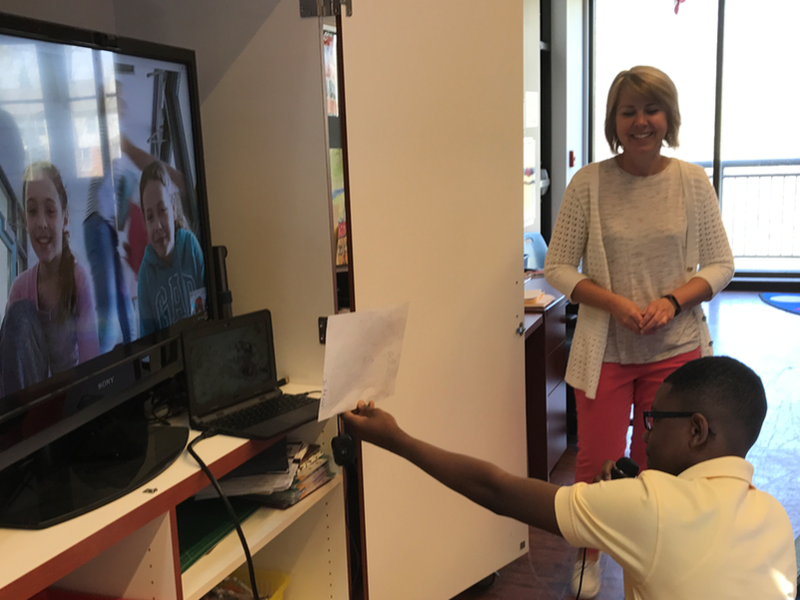 For our first art Skype project, all of our K to 8 students participated in the 3rd Annual Global Awesome Squiggles project. 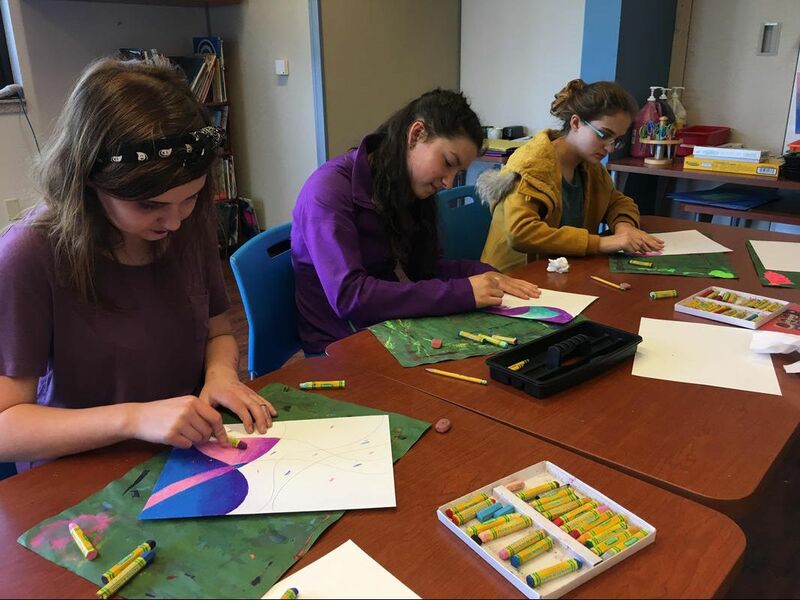 Students around the world used the same 4 squiggles to create unique artwork using the medium of their choice. Viewing creations from other cultures was fun and educational. The first and second grade students worked on incorporating movement into their artwork. 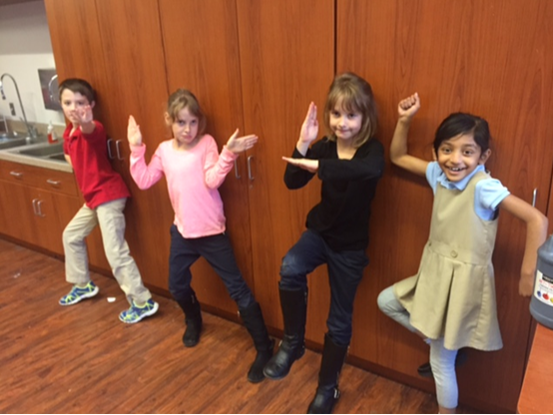 Students split into small groups, practiced different action poses, and posed for each other. As each partner drew, in order to make his figure look as if it was moving, he added movement lines. We practiced using different lines to show what was moving, and in which direction. Later, the students made up stories about their figures going places. 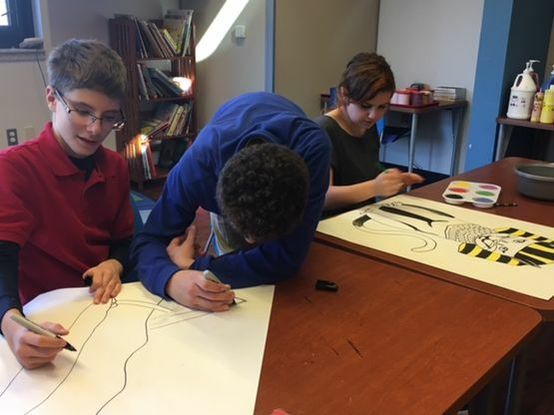 Middle school students worked collaboratively to create posters for the Book Fair. Their designs were used to promote the event. Our end-of-the-year art show showcased the children's incredible talent and creativity. ​We have some very talented artists at ECA! 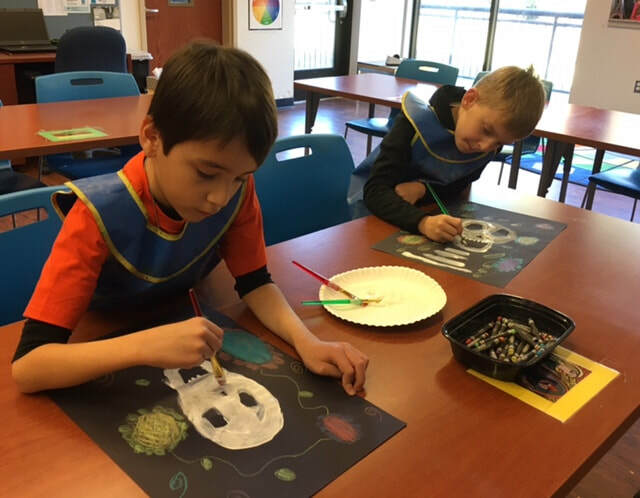 Our elementary students entered the Michigan Green School Art Contest, along with 200 other Michigan students. Five Eagle Creek students placed either first or second in their division! Congratulations!